The shore power failed at 6:00pm last night. Of course it was just after the last of the boatyard staff had departed for the day. I checked all the shoreline connections in the dark using Jan’s penguin and none had fallen into the cut creating a short circuit. As all the boats had lost power it was obvious the circuit breaker in the workshop will have probably overloaded and tripped. Back at Ufton I discussed the situation with Jan. The domestic batteries on the boat are somewhat old and tired (like me) so we decided to run the engine until 8:00pm to ensure they we fully topped up. Then we’d turn off as many of the consumers as was safely possible. This should leave sufficient power in the batteries for Jan to do the most critical thing that evening…… watch the latest episode of Midsomer Murders on TV. Don’t you love it when a plan comes together! With no heating in the boat last night we cuddled together under the thick white duvet like two large maggots! This morning I volunteered Jan to get up and make us a nice hot cuppa. This decision was a “no brainer”….. It’s perfectly logical that the person who sleeps nearest the toilet and galley should be the one to get out of bed first! There would be a complaint if I tried to climb on top of her in bed. As for the daylight activity…… All of our previous visits to Newbury have been on market day (Thursday) and as a result I hadn’t taken much notice of the imposing building surrounding the market. The latest visit to Newbury wasn’t on market day and as a consequence the market square was emptier than usual. I immediately noticed the Corn Exchange building (AD1861). It’s an impressive looking structure. As the name suggests, it was built with the purpose of marketing locally grown corn. However with the decline of the local corn industry it was turned into a meeting hall before eventually becoming an arts centre. It also contains a theatre. Those of you who know your agricultural history will remember corn isn’t native to Europe. Like potatoes; it’s native to America and were bought to Europe in the 15th and 16th centuries by European invaders explorers such as Columbus. Interesting to think prior to Columbus there was no potatoes or rice in England. The majority of the population would have been eating a diet that mostly consisted of grain gruel, a watered down version of porridge! How tasty…… Aren’t the effects of international trade interesting. The natives of South America gave us corn, potatoes and tomatoes. We gave them smallpox, measles and syphilis. On the opposite corner of the market square is the old Town Hall. This building dates from 1910. 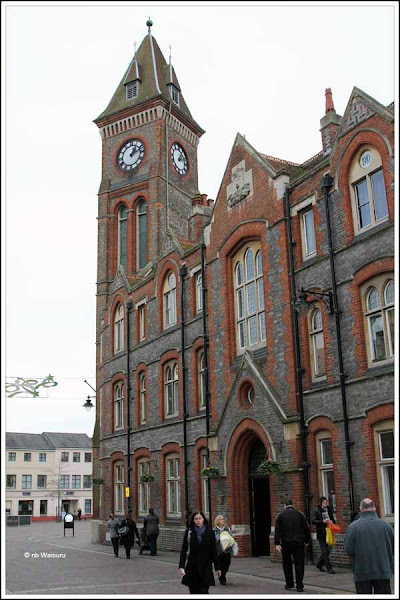 Newbury Council has outgrown it moving to new premises close to the railway and bus stations. I know they moved because I went to the new chambers to apply for my seniors bus pass. Oh dear, oh dear, Tom – brace yourself! "Corn" in British English refers to wheat, barley, oats and rye, not that American upstart, maize, and was traded around the known world for centuries, even millennia, before Columbus sailed the ocean blue. Similarly, rice arrived in Europe direct from the Far East by overland routes. Hope you get the power restored quickly this morning. So a corn exchange was used to trade all types of grain. 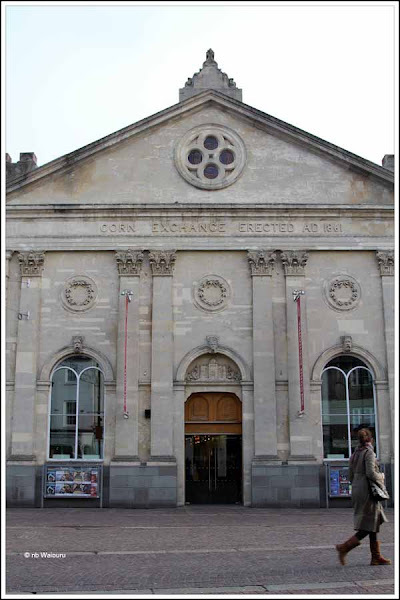 But where is the oldest corn exchange in England and does it pre-date the arrival of corn (maize) from the new world? Also, if all grains were commonly called corn why is the newcomer (corn) now known as corn and the other grains known by different names?